I have been fortunate to have been one of 18 international participants selected for the following event! It is very exciting to get to head to London to work with some very interesting and exciting people! “The British Council presents Film, Archive and Music Lab: a week of screenings, live performance and collaboration between film and music professionals in partnership with the British Film Institute, PRS for Music Foundation and HOME in Manchester. The week will begin on 29th February 2016. Film, Archive and Music Lab will explore the creative potential of collaboration between the worlds of cinema, film archive and music. The British Council has invited 18 artists and producers – including music makers, film makers and video game composers – to take part in a series of workshops, masterclasses, screenings and networking events all with the aim of increasing opportunities for cross-sector work, while providing a fertile breeding ground for future collaborations. The programme is inspired by the creative and popular success of event cinema and live performances of film scores, including the BFI Archive’s international tour, “The Hitchock 9“. We’re bringing together an exciting group of participants from East Asia and the UK as part of this opportunity for professional development and they are: Lisa Meyer, William Doyle (East India Youth), Masaaki Yoshida (Anchorsong), Ruth Paxton, Jessica Curry, Roly Porter, Shiva Feshareki, Lisa Gunning, Nick Abrahams, Jay Bedwani, Owen Wang, Aoura Chandra, Nguyen Manh Duy Linh, Nguyen Quoc Trung, Fikri Fadzil, Jeremy Mayall, Chunhwi Park and Thanapol Setabrahmana. PRS for Music Foundation has helped to fund and select the UK based music creators who are taking part in the Lab. It has been awhile… I always intend to keep more regular blog posts, but things get in the way – mostly it’s good things like getting caught up in the studio working on new music, so I can’t really complain. Since last time there has been a bunch of stuff that I thought I would collate here into one handy place – lots of links to things to listen to and watch. And an interview with SOUNZ. And an interview in Down In Edin Magazine. Premiere performance of ‘Points of Flight‘ for violin and electronics by Tessa Petersen. LAPWING – is cranking around the festival circuit. Mr Baker (48 Hour Film) from Joe on Vimeo. Back to work – there is some more research to be done on multisensory music (music and taste), as well as a new orchestral piece waiting to be composed. Another quick update, still furiously working away on the phd. I believe the end is in sight… I hope so! I am also working on a piece for four pianos, a piece for guitar, some solo instrument pieces, and a couple of new larger scale theatrical pieces (more details to come soon). In the meantime, here are a couple of recent pieces. First, a film from the 48hours film fest made by Joe Hitchcock and his daughters. Scored by The Scorelocks Collective. A cute little story about a group of princesses. Princess Rose and the Rose Flowers and the Other Princesses. from Joe Hitchcock on Vimeo. And then we have a new piece for piano and electronics in my ‘Imaginary Communication’ series. It has been a hectic past few weeks… and looks to be more of the same until October. You can now find all of the videos from my PhD Concert Showcase collected in one handy little vimeo channel. You can find those videos here. Writing more words for my phd thesis… I think its at about 4500 words that I am actually happy with! Still a lot of writing to do. A film (‘Serve and Protect‘) that I did sound design and composition for has just received word of its first international festival screening. Wrote some score for a film (based in New York) that is about to start kickstarter fundraising – more info to come. Have been discussing some possibilities for some international performances of my music… still more details to be sorted! Finally, had the world premiere concert of my piece ‘Sketches of an Intergalactic Earworm‘ for Piano Trio and BOOMBOX at the University Okta Contemporary Music concert. Will be doing a full recording and video of this piece in early October. 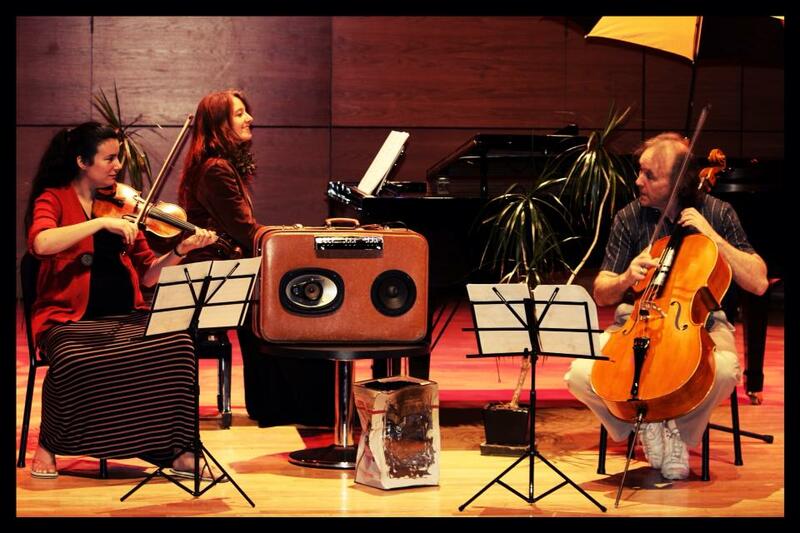 Here is a pic from the rehearsals – featuring the NZ Chamber Soloists (Lara Hall, Katherine Austin and James Tennant) and an upcycled suitcase boombox constructed by my father. Well, it has been a long road on this re-write of a piece for my PhD. Many changes and re-arrangements, constantly fine-tuning the mix, the video is being edited… and it is finally reaching a visible end point. Plus I have had some feedback from supervisors & colleagues saying that the piece is much stronger now – so I guess all the stress and work was worth it! The piece started out as “They say a word is dead”… and is now called “The Long White Cloud”. I am very much looking forward to sharing it with you soon! 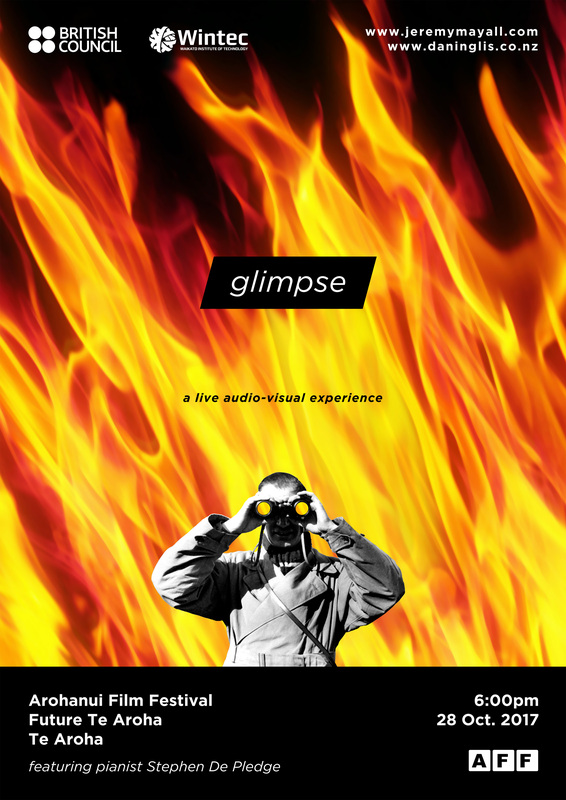 – The exhibition of the collaborative moving image piece ‘flow’. – still working away on my piano trio piece. Good things are happening, and soon there will be lots of new music for me to share! While you wait, go and check out my soundcloud and listen to some previous work! Or check some videos out on youtube! Another short film that I worked on with the Scorelocks Collective is currently making its way through the festival circuit. The film directed by Attila Adam is an intimate father and son tale, tracking the morning of their first hunting trip together. Winter Storm – Trailer from Popscure on Vimeo. This is my first major post for 2013. I have been busily working away in the studio crafting some new music for my PhD… lots of notes on paper, and sounds in the machine – but it is slowly coming together! But, as a treat for 2013, I want to present to you a film that I helped make in 2009. The film is called “They No Longer Sleep Alone” – it is a short feature (46mins) filmed in and around Hamilton, NZ. The film is essentially silent, but accompanied by the music from a synth-pop concept album that I recorded and released as a band ‘…howard’ with collaborator Thomas Botting. The narrative from the songs is played out in moving images on the screen. The whole thing (songs, recording and film) were all put together independently (by Chasing Time Productions and myself) with very!! minimal budget… and I think we have come up with a fun little film. AND! – Now you can watch the entire film online. And if you are interested, we have physical copies for sale! (includes DVD with special features and AUDIO CD). Flick me a message if you are interested!